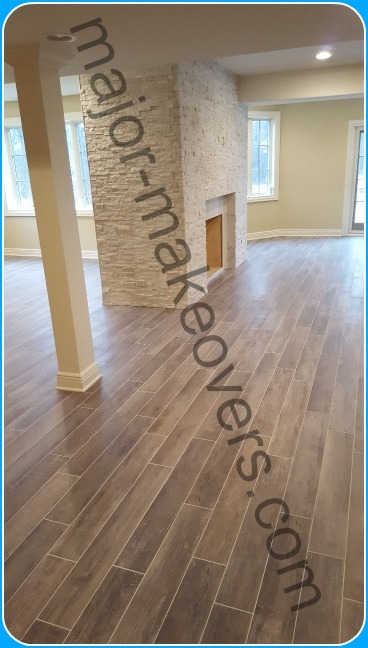 This basement floor tile installation project includes the 6 by 39 inch Capella Ash wood-look porcelain tile and the light colored Mobe Pearl stain resistant grout that never needs to be sealed, per manufacturer's instructions. This picture shows just one corner/end of the 2,750 square foot walk-out basement that takes you out on a nice patio and within yards of the forest's edge for a relaxing atmosphere (weather permitting) and even year-round deer watching. After tile shopping and making a final tile choice, the homeowner realized he couldn't place his tile order as one does in a regular big box store because some companies don't sell directly to the public. How do I buy tile or other home improvement products from places that don't sell directly to the public? Some companies only sell to members and others sell directly to the public (you) only if you were referred to them by a member company. 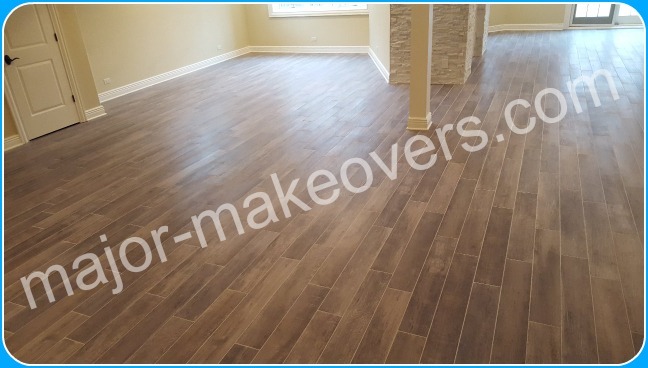 Soon after the above homeowner asked for our advice/help/referral, he was able to place his tile order directly with a ProSource Wholesale home improvement showroom where we (Major Makeovers) are a member. By the way, if you are interested in visiting or even ordering from a ProSource showroom most people don't know about, you can do it the same way the above homeowner did. Choose your state below and see if a showroom is close enough to your area and if so, you can have a free access card/picture that allows you to visit and/or order directly from the ProSource wholesale showroom. 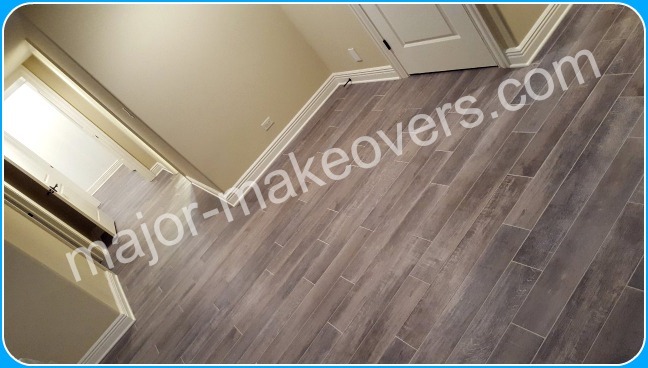 This Burr Ridge basement floor tile installation project started with the homeowner's desire to upgrade from carpet to porcelain tile that imitates the look of old wood boards. Even though more tile kinds imitate the brown-ish wood look found inside many homes, there's also the gray-ish wood look seen mostly on the outside of very old wooden structures like barns, some fences, etc. 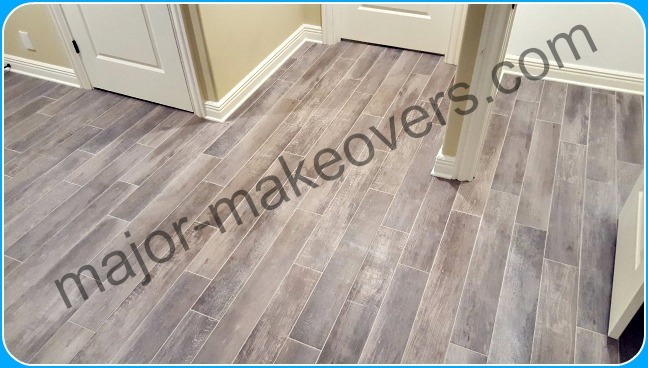 That's the look this homeowner wanted to go for and it led him to choose the gray old wood look variety found in Capella Ash porcelain tile. Even the word ash found in the tile's name, points to the gray color. Jump over installation work to see pictures of the finished Burr Ridge basement. And here's some of this project's 'history'... Placing tile order, delivery, protecting furniture, etc. and planning the basement floor tile installation. The homeowner placed his tile order directly with the showroom and as soon as the tile shipment arrived, we were ready to deliver it to the job site. 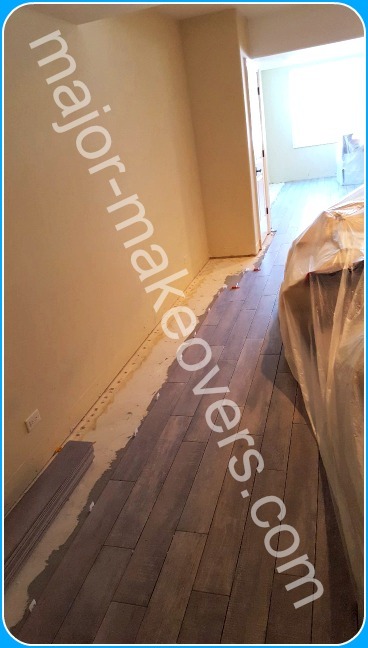 The floor was bare concrete because all the carpet and wood baseboards were removed prior to the homeowner contacting us for basement floor tile installation. The baseboards were 'saved' in a big pile in the middle of the floor and the plan was to restore and reinstall them after the basement floor tile installation is done. 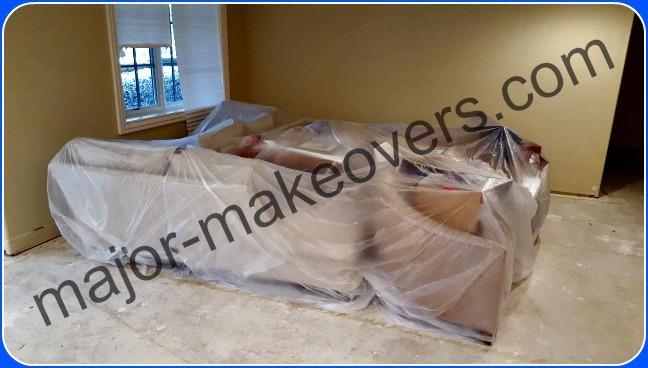 We carefully placed all the furniture and other objects together in 2 areas of the basement and covered everything with plastic sheets and tape to prevent any dust from getting to them. There was actually close to no dust due to the tools and techniques we use. Whoever removed the carpet may have caused way more dust just by pulling the carpet and padding out, compared to our basement floor tile installation work. 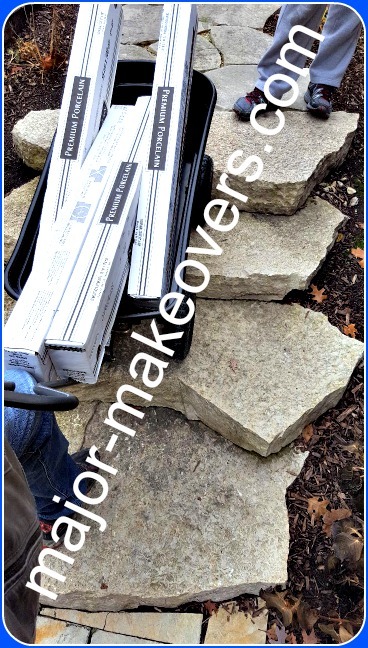 Tile delivery from showroom to driveway - easy! Tile delivery from driveway to basement - not easy. In order to protect the very long driveway from potential damage by heavy truck delivery, we decided to deliver one palet of tile at a time in cargo vans. There were a total of 5 pallets of tile and 1 pallet of thin-set bags. Delivering each tile pallet to the end of the driveway was quite easy - just drive. The driveway's end was at ground/street level and to get from there down to the back of the house, there were 125 feet of downward walk on uneven stone sidewalk and about 8 random stone steps with 4 of them very close to one another and very uneven/natural stone edges as you can see in the picture. The height drop over 125 ft. was about 12 ft. The fastest and safest way of carying all those tile boxes was by 2 people using a special cart to take 4 boxes at a time down the rough terrain. The shock absorbing wheels and the human 'help' over each rough step, made the whole delivery faster and easier on the body than if each box was carried one at a time by one man. By the way, using the front door to carry the tile to the basement was not an option due to many factors including taking hallway/stair turns with 40 in. long boxes, the heavy weight of each box, the time it would take to complete the delivery, the potential of one wrong step or slip on fine hardwood floors or stairs and the desire to avoid affecting the customer's routine in any way besides the basement floor tile installation work. After delivering all 4 pallets of tile and one pallet of 48 mortar bags, all in one day, we were ready to begin planning for the right basement floor tile installation. 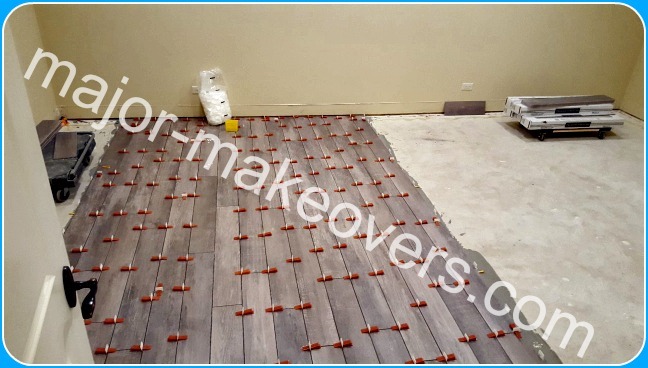 Smart planning and the right tools are the essence of a great basement floor tile installation project especially when dealing with long format tile. 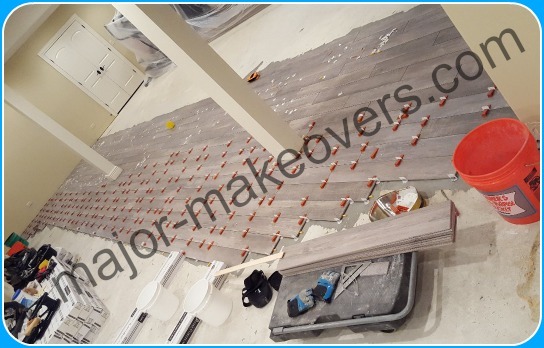 After the homeowner's decision to have the tile run east-west, we started planning how and where to best begin the basement floor tile installation. Other areas not included in this project were: the travertine bathroom and a 300 SF storage room with a second furnace. And now, it finally... begins! Well, there's actually more decision making involving the homeowner. 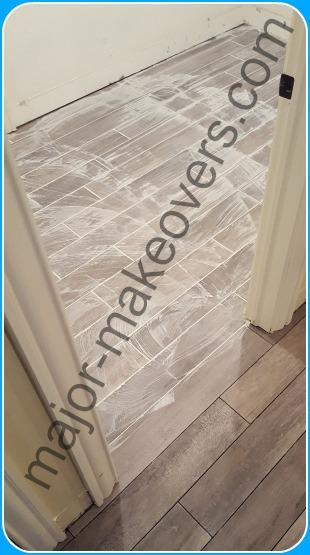 After narrowing down their grout color to 2 choices from our grout samples, they wished to see the samples more like the final look of installed tile would be. We did just that for them... and more! Getting some tile leveling pieces to hold 2 tile together, we did a sample of 2 grouts at a 1/8 in. width and the same thing for a 3/16 in. wide grout. The grey tape separates the light grout from the darker one so they dry separately and don't mix while wet. Besides seeing the 2 grout color samples, they got to see 2 grout line widths. The winner was the narrower 1/8 wide light colored grout (seen at top left). Beginning the basement floor tile installation using the 39 inch gray-ish wood-look porcelain. After a combination of tape measures, laser lines and calculations, a straight line was marked on the floor. This line runs parallel with the main outside wall that has the best chances of being straight. And that's the line where the first tiles are placed down and installed being perfectly alligned with it. As you can see, the red/white plastic on the tile is a 2 piece tile leveling system that is strongly recommended to be used. It came along on the market especially in the last years since the advent of the (very) long format tiles. This tile leveling system makes sure your tile will dry perfectly level and avoids tile lippage (a tile edge being higher than the next one causing visual imperfections or even a tripping hazard). Some tile installers may tell you they don't need to use it (being as good as they are) but that statement doesn't hold water when tiles are (very) long on one side or even both. Even in 12x24 inch tile, the leveling system gives you peace of mind. Take the above picture for example... the tile length is 39+ inches and they can be slightly bent from the manufacturer. Add to that the randomness of each next row where tiles are offset by a few or more inches, same as the randomness of hardwood floor (the lines must not match from one row to the next). That's were the leveling system holds tile edges level overnight or 24 hours until the thin-set dries and takes over in 'holding' the tile level for good. Having the right tile cutting tool besides a wetsaw. A wetsaw is an electrical tile cutting machine that is definitely needed for most tile jobs and uses a diamond blade to cut tiles. A 'dry' tile cutter (hand tile cutter) is a score-and-snap tool that is used for straight cuts, especially cuts that go against walls. This tool is needed in addition to a wetsaw and has some advantages. Take the above picture for example: The tile that's just been cut is 39+ inches long. It takes a few seconds to cut it and there's very little noise and no water involved. If the same tile was cut with a wetsaw, it would take a longer time and cause very loud and useless noise in your house/garage, not to mention useless blade wear. It's a no brainer, right? The fact is, most tile cutters handle tiles up to 24 in. long and few tile installers invest in more expensive longer ones. 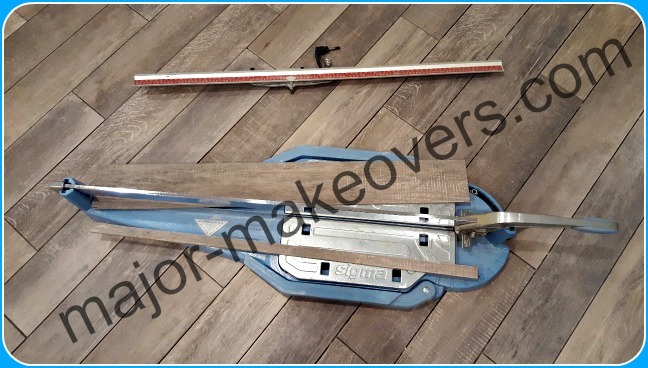 The above pictured tile cutting tool is a very expensive one imported straight from Italy and can 'officially' cut 36 inch long tile (3 ft.) but it actually works even with a 39+ tile if one piece is temporarily taken out of the way, as the picture shows. The same tool also comes in a version that can cut 48 in. long tile (4 ft.). Continuing the basement floor tile installation with 6x39 in. wood-look porcelain. If you were to have your big basement painted, more painters could work in different areas/rooms of your basement and get the job done faster. This is not the case when talking about a basement floor tile installation that must seamlessly run throughout the whole basement without any dividing lines at doorways or other demarcations. Basically, you can't have more guys start tiling in more areas of your basement and perfectly meet in the middle when done. No. No way. As tiles are installed, they cannot be stepped on untill the next day or 24 hours later, per thin-set manufacturer's instructions. This brings up the fact that at the end of each day the installer(s) must not lock themselves in, behind freshly installed tiles with no way to get out without stepping on tile. This fact also limits in some cases how much tile can be installed in one area and good planning is extremely useful for best results. 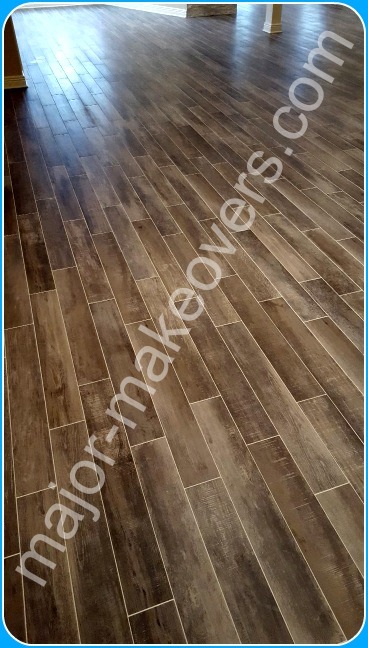 Long format tile installation in basement bedroom/office. For example as soon as the basement floor tile installation reached this office/bedroom door towards the end of a workday, 2 rows of tile were installed all the way to the wall (by the white bag). You can easily spot the 2 tile rows as the ones not having red/white leveling system on them. The picture was taken the second day when the 2 tile rows were dry and the leveling system was removed. This allowed the tile installer to install a few tile rows on the left side getting within less than 2 ft. from the wall, which is the least amount of space he needs to stand/kneel and work. He then steps/jumps over the rows he's just installed onto the 2 rows dried from yesterday and continues installing more rows on the right side (as seen) making sure he doesn't lock himself in, but has enough room to get out the door without stepping on the freshly installed tile. He can move to another area of the basement now and continue installing there following the same general rules. The next (3rd) day when all these tiles in the picture are dry, he can stand on them and work on the left side finishing the area by the wall. He them moves to the right side and installs as many tile rows as possible, making sure he can either jump over them or use a 'bridge' made of strong enough wood (2x6 or so) to get out. On the 4th day he'll be able to finish installing the last few tile rows by the wall. Another basement area about to get the last few rows of porcelain tile installation by the wall. This area of the basement measures aproximately 50 ft long from the unseen wall behind the person taking the picture to the bright window seen ahead in the 'distance'. 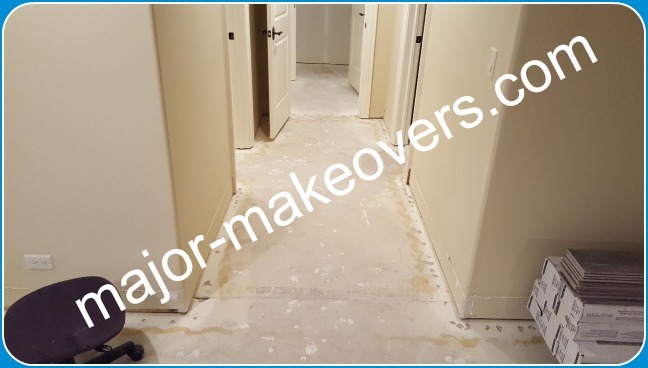 By now, you can tell that the tiles shown in this picture were installed at least the day before and the tile leveling system was already removed. Things are being set up for the installation of the last few tile rows by the wall. As you can see, there's a closet 'in the way' and the same visible concrete floor continues on the other side. Another detail seen in this picture is a small part of the the plastic sheet covered furniture and other things that are now all placed on top of tile after being moved from the concrete area where they were set in the first place. 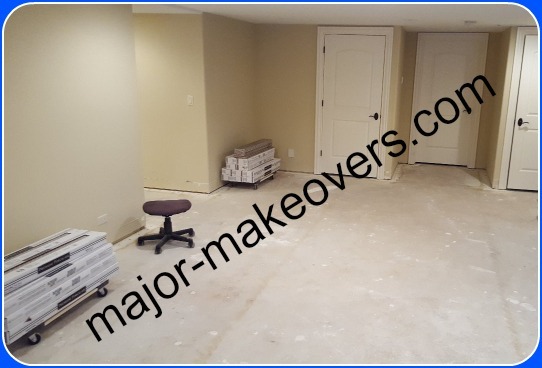 It was a move needed to be done in order to tile that initial area covered by furniture and by the way, the same was done to another 'gathering' of furniture in a different area of the basement. The closet seen in the above picture is actually the sump pump area which by the way, got the same 'treatment' like the rest of the concrete floor (got tiled). Sump pump floor area gets the same basement floor tile installation 'treatment'. 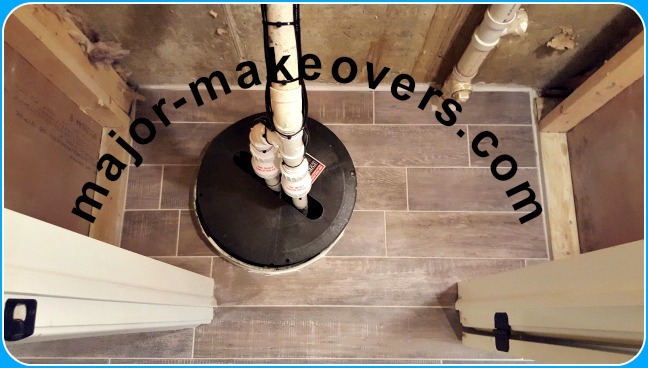 Porcelain tile were installed all the way around the round cover of the sump pump area to match the rest of the floor, even though the builders usually don't finish these kind of places with drywall and not even wood trim around doors. 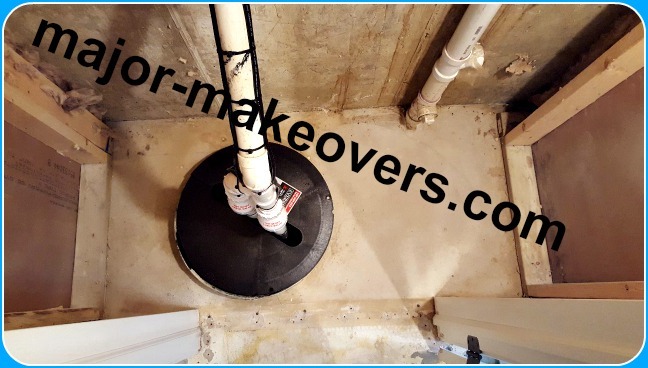 But when you open the door and look, it feels and looks much better with tile surrounding the sump pump cover and matching the whole basement floor tile installation, compared to bare concrete. Grouting the new porcelain tile basement floor. After all the areas of this Burr Ridge basement were tiled, it was time to start grouting. This picture was taken shortly after spreading the grout on this hallway, but before washing it away. That's why you see the white grout streaks which is the normal look after spreading the grout with a grout float but before washing/cleaning the tile. The bedroom/office we talked about earlier is the door on the left side and now you can piece together how the first 2 tile rows that were installed all the way to the other side of the bedroom/office, started on this hallway. The door on the left side is the basement bathroom (full bath that is) which already had 18x18 in. travertine tile installed on the floor including 4 inch travertine baseboards. At the very end of this basement hallway (above picture) there's a small storage closet and just before that is one of the 2 furnaces this house came with. The furnace is not seen in this picture, being placed just to the right of this hallway. Continuing grouting and washing/cleaning the excess grout off the new wood-look porcelain tile. This messy looking floor is actually the normal view of grout that's just been applied/spread throughout the floor and pressed down between tile in the 1/8 in. spaces. This grout must be wahsed away within minutes because if left there too much, it'll start drying hard and become very difficult to remove. Considering there were 2 different areas of the basement with lots of furniture and other things covered with plastic sheets, grouting the tile had to be done at least in 2 different days. Whatever areas were grouted the first day, were dry the next day so the furniture could be moved on the newly finished floor tile and away from the tile about to be grouted. A grout cleaning machine was used to clean most areas except the very small closets or other narrow spaces where the machine doesn't fit and the traditional hand-sponge-water method works best. This picture shows the same messy area as above but now the grout excess has been removed and the porcelain tiles are clean. The grout needs to dry overnight so the best way to avoid anyone stepping inside by accident is to close off the area with yellow caution tape and even add a written sign that says: Wet grout. Do not step on tile. The written sign alone would be sufficient for most people but the additional caution tape helps with children who can't read yet or people who don't speak/read English. 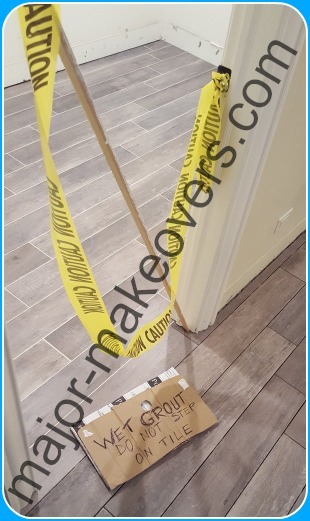 It must be mentioned that even though our contract specifies that, for their safety, the homeowner should keep persons and pets away from tools and work areas at all times, what actually happens in some situations is that people get curious to see the new tile and even their guests want the same so the yellow caution tape works/helps very well. 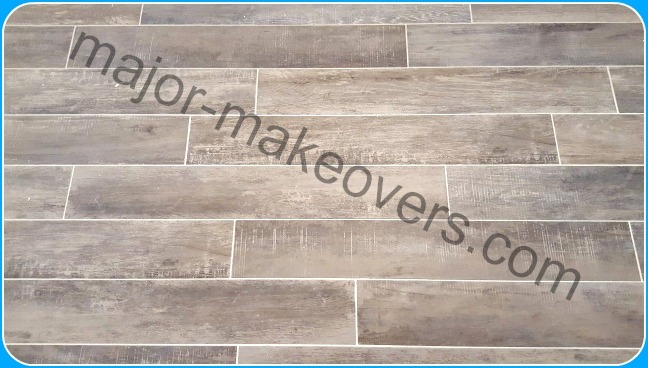 Close-up on Capella Ash gray-ish wood look 6x39 porcelain tile grouted with mobe pearl grout. This picture may qualify as a close up of an area of about 3.5 by 6.5 feet of this freshly grouted Burr Ridge basement floor tile installation project. You can clearly see that each piece of tile is more or less different than the next and all of them resemble the look of rustic wood boards seen in an old barn. Besides differences in color, shade and other details, some parallel lines can be seen running on the width of some tiles, imitating marks left by old wood tools when shaving/cutting boards to have the same thickness. Another unique feature of this floor is that each row of tile is placed in a random position, meaning, is not brick style. The brick style has only 2 row positions that keep repeating with a row usually being offset by half a tile compared to the previous and next rows, which are the same. So in a brick style, rows 1-3-5-7-etc are all the same and rows 2-4-6-8-etc are off by half a tile so it's basically a situation where rows 1-2 keep repeating. That's not the case in a random installation which is more like a hardwood floor look where the boards are randomly placed and the only thing to avoid is having the short side of the board align with the very next row. In our tile case, no 6 inch grout line should be aligned with the next 6 inch grout from either of the 2 neighboring tile rows. It must be offset by at least a few inches. Wood baseboard restoration, reinstallation and addition of base shoe (quarter round). 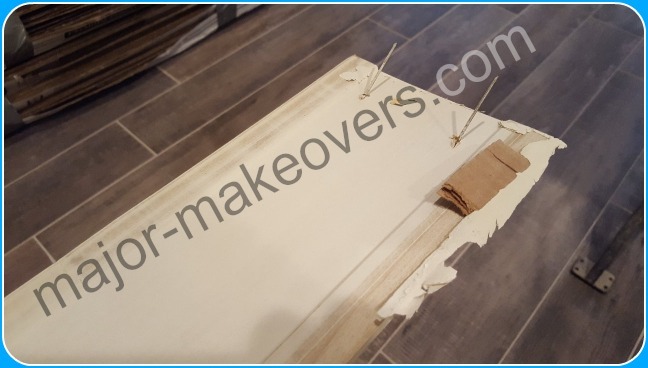 The baseboard that was removed prior to our starting this project, was placed in a big pile with nails sticking out from all boards and other things hanging like paint peeled off the walls, white silicone caulk end even door stops that were still attached to the wood. Given that the baseboards were fairly new, made from real wood and all together were many hundreds of feet long, the homeowner wanted to restore them and have them reinstalled and painted. 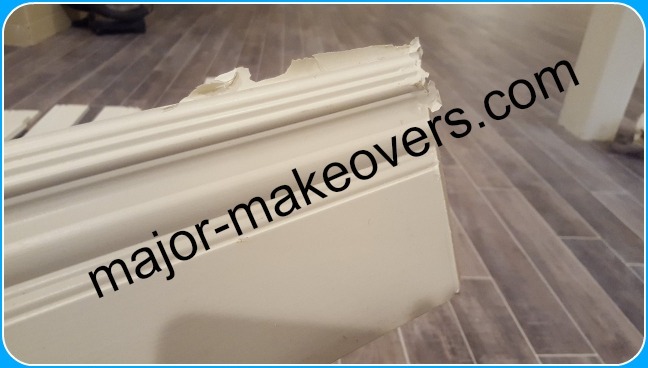 It was the best decision as nothing was wrong with them and the only negative factor was the view before restoration as seen below on the front and then back of the end foot of a long piece of baseboard. Peeling paint had to be removed, finish nails had to be taken out, old silicone caulk scraped away including any other loose part that didn't belong there. There was also a little bit of a puzzle trying to figure out which piece went where, and then install them all back in place. Given that the previous flooring was carpet, the baseboards alone were enough. Every time the carpet is removed from an area and replaced with mostly any other floor except carpet, there's a need to add base shoe (or quarter round) which is a small rounded piece of wood that gets installed at the bottom of the baseboards. 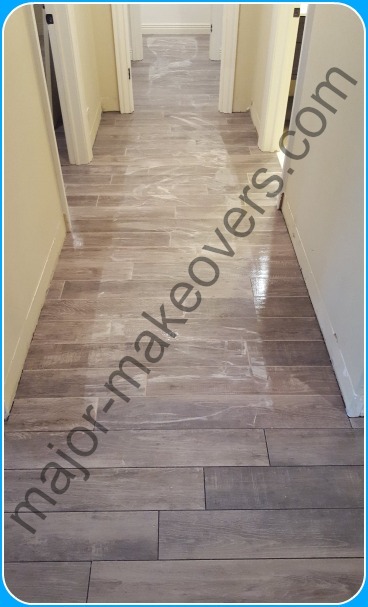 This was purchased and installed right after the original baseboards were in place, then we were off to fill up nail holes and other imperfections with wood filler. Painters' tape was applied to floor and wall and the baseboard and base shoe were painted together as now they looked like one complete wood piece running all around the bottom of all the basement walls. You can see the baseboard installed and painted after all floor tile were grouted. Basically, the following pictures show this Burr Ridge basement floor tile installation project coming to a completion. The basement has 9ft. high ceilings and a floor-to-ceiling stone covered fireplace. 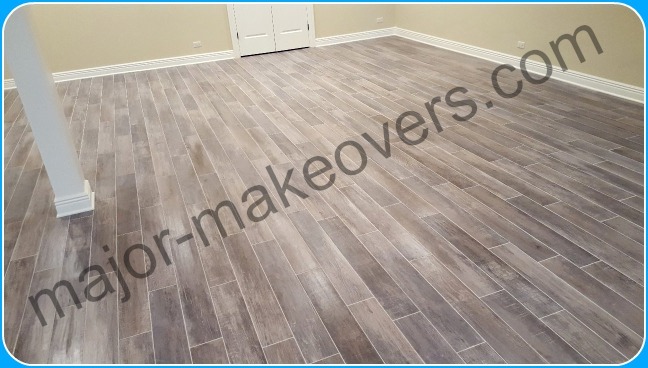 Differences in shade/color between pictures are due to lighting conditions and other factors at the time the pictures were taken but overall they serve the purpose of showing you the finished look of this basement floor tile installation project. 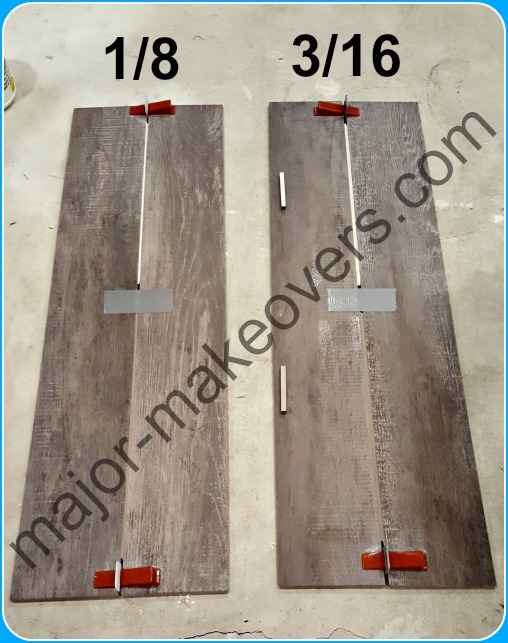 The above and below pictures clearly show the wise decision of restoring the baseboard and reinstalling them as they were in perfect condition and already cut to size. Some prep work and a new coat of paint made everything brand new. This was quite a long page/article so congratulations on making it to the end of this basement floor tile installation project. If you're looking for the right tile installation company for your high-end home, be that in Burr Ridge or other affluent Chicago suburb, feel free to CONTACT. If you want to visit and/or even purchase a huge variety of home improvement products directly from a showroom that most people don't know about, click here to choose a showroom. The completed fireplace you see to the right was actually our next project immediately after the porcelain floor was done. It has stone on three walls from floor to ceiling and white marble around the opening of the fireplace. White pencil tile was chosen to finish the left side (as you look at the picture) because the stone ends there and the homeowner wanted pencil tile to cover the stone edges. Hope you enjoyed following along this basement tile project. 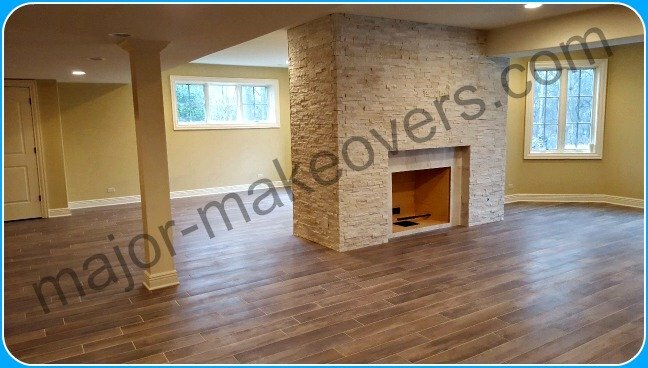 You now know some of the things involved and what to expect when time comes to have your basement or other tile projects done in your home. Do you know about ProSource?